I ran across a few photo's this week from the "ELLE Street Chic Daily"
These are some of my favorite items from this past week.. I love the pants. I have been looking for a comfy and fab pair of trouser jeans, but have had no luck.. I guess I have to make a pair... Look @ that bright floral bag...I love it! I finally got a chance to sit down and photograph most of the fabrics for my website. It took longer than expected because the kitties enjoy being in everything including the fabric. It was tough to "shoo" the cats away, lint roll any stray hairs and photograph at the same time, but I did it and I am happy with the results. My daughter wanted a pet snail for the longest time. I did some research to try to find one and found that the best place to get a snail was outside your home. Purchasing a snail online was a bit tricky with all the laws in transporting them from state to state. Well, after several months of searching at night and under bushes and trees we gave up. Snails aren't common where we live so unless we moved to a "snail friendly" area, finding a snail outside wasn't going to happen. Just so you know... you have a few more days left to get in on the July sale. There's a free gift with each purchase. 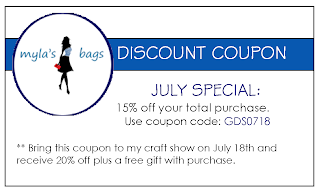 I have a craft show coming up this Saturday @ the GDS Fairgrounds. If you are in the area, please stop by and check out all the crafty goodies for sale. 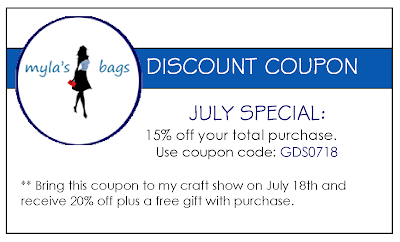 I will also be offering the discount to my online customers. I got this in an email and thought I'd share. This is a speech written by motivational speaker Veraunda Jackson. 4. Quit complaining about things you can't and won't change! 5. Quit gossiping about other people! Minding our own business should be a full time job! 6. Quit blaming each other for things that in the big picture aren't going to matter three weeks from now! Talk solutions....and then implement them! 7. Quit eating things you know are not good for you! If you can't quit... eat smaller portions! 8. Quit buying things when we know we can't afford them! If you don't have self control, then quit going to the stores! Quit charging things, especially when you don't NEED them! 9. Quit staying in unhealthy relationships! It is not okay for people to verbally or physically abuse you! So quit lying to yourself! It is not okay to stay in the marriage for the children! Ask them and they will tell you that they really would prefer to see you happy and that the misery you and your spouse/partner are living with is affecting them! 10. Quit letting family members rope you into the drama! Start telling them you don't want to hear it! Quit spreading the drama! Quit calling other relatives and telling them about your cousin,uncle,or aunt! Go back to #5 minding your own business should be enough to keep you busy! 11. Quit trying to change people! IT DOESN'T WORK! Quit cussing people out when you know that they are just being the miserable and jealous people that they are! 12. Quit the job you hate! Start pursuing your passion. Find the job that fuels your passion BEFORE you quit! 13. Quit volunteering for things that you aren't getting any personal fulfillment from anymore! Quit volunteering for things and then failing to follow through with your commitment! 14. Quit listening to the naysayers! Quit watching the depressing news if you are going to live in the doom and gloom of it all! 15. Quit making excuses about why you are where you are or why you can't do what you want to do! 16. Quit waiting on others to give you the answers...and start finding the answers for yourself! If what you are doing isn't working for you... then quit it! 17. Quit settling and start making your dreams a reality! Quit being afraid and START LIVING YOUR LIFE! CREATE THE LIFE YOU WANT! If you want something different than what you have had in the past... you must quit doing what you have done before and DO something different! JUST QUIT IT ...... and START DOING something to create the experience you want!